This past weekend I made a 2nd birthday cake for the nephew of one of my best friends. 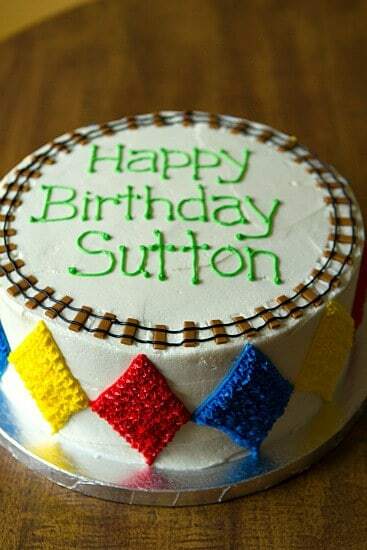 The decorations they wanted were fairly simple – a lot of bright, primary colors (much like what was used on the clown smash cake), with a train track running around the outside of the cake. 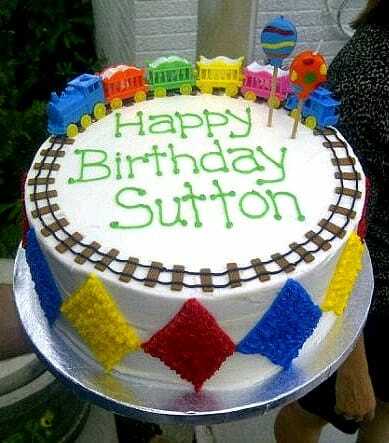 The train set on the cake was used on birthday cakes when the little boy’s mom and aunt were little, and they wanted to continue the tradition. The track ended up being the perfect size to set the train on! 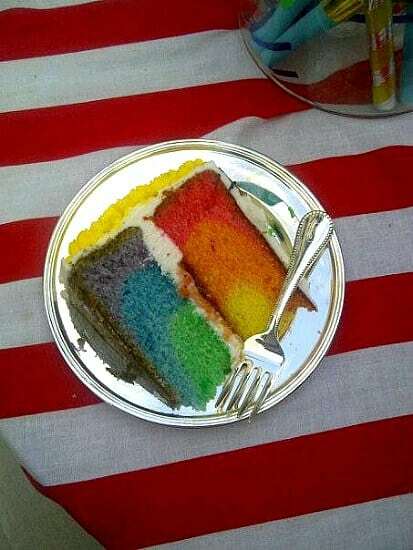 But the real magic of this cake was on the inside… a rainbow cake! I have made a few children’s cakes like this before, and have been asked how it’s done, so I thought it was high time that I put together a tutorial for you. It’s such a fun, whimsical way to brighten up a child’s birthday cake, and is incredibly easy to do. 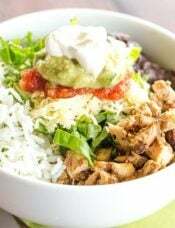 Below are the step-by-step instructions with photos. Have fun! First up, you’ll want to have your favorite white cake recipe handy. 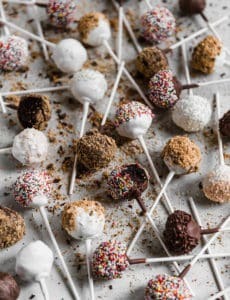 My personal favorite is the Perfect Party Cake, but any of your favorite recipes will work, and you could always use a box mix too, if you prefer. A quick note on cake recipes… I always use this Cake Batter Chart from Wilton when baking cakes that I’m going to decorate. 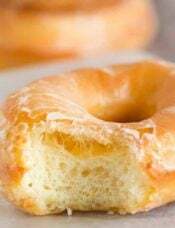 They call for more batter than you would typically use, but the cakes bake up nice and tall and, once leveled, create wonderfully high layers. Not only is more cake better for everyone, but you have more space on the sides for decorating! To give you some perspective, a typical recipe for a 2-layer 9″ cake yields anywhere from 4 to 5 cups of batter. Now, grease and flour those cake pans! 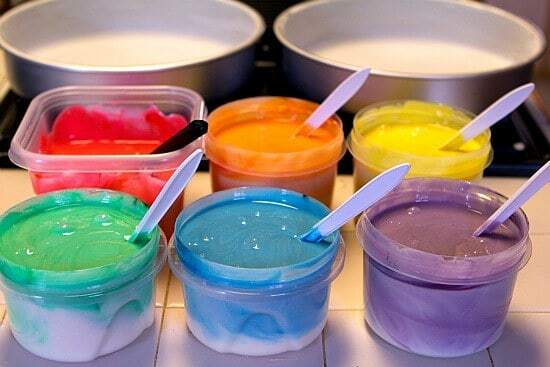 Now, round up your food coloring – liquid or gels. A lot of people have said they have great success with the AmeriColor gels, but I still had some liquid food coloring from other recipes to use up, so I went that route. Time to color away! You’ll want to make the fun rainbow colors, naturally: red, orange, yellow, green, blue and purple. If you’re using the little 4-color kit like me, just combine red + yellow for orange, yellow + blue for green, and red + blue for purple. Option #1: You can make one cake layer red, orange and yellow, and make the second layer green, blue and purple. I chose to do the cake this way so that the individual colors really popped and you could see all of them really well. Option #2: You can do all six colors in each layer. To do it this way, divide each color in half between the pans. So, half of the red would go in one pan, and the other half in the other pan, and then proceed the same way. As I mentioned, I used Option #1, so that’s what you’ll see illustrated here. 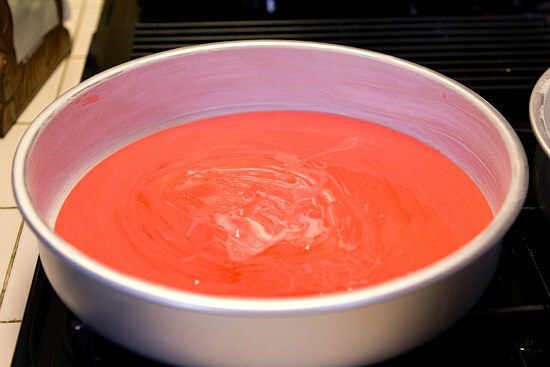 First, pour the red batter into the bottom of the cake pan. 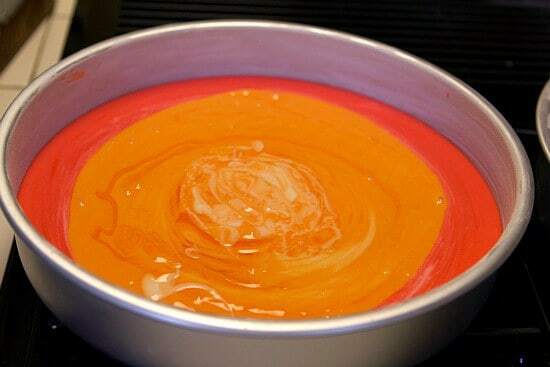 Next, add the orange batter on top of the red. Slowly pour the batter into the middle of the pan. As you do so, the red layer below it will spread out. 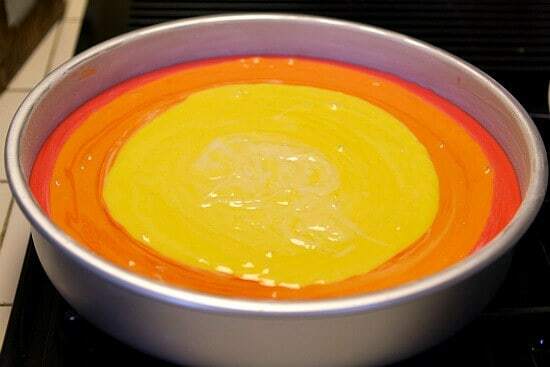 Finally, pour the yellow batter in the same way you poured the orange. Repeat the process in the other cake pan, starting with the purple, and then adding the blue and green. Once the cakes have completely cooled, I like to wrap them in plastic wrap and refrigerate them for at least an hour. I find that it’s much easier to level cold cakes then room temperature ones. They are firmer and don’t crumble, making for a cleaner cut. I use this Wilton Cake Leveler to level my cakes. 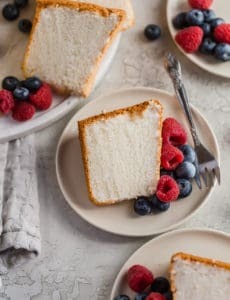 It’s super cheap (less than $5 – you can find them at a place like Michael’s), and makes it incredibly easy to make sure the cakes are sliced evenly and cleanly. 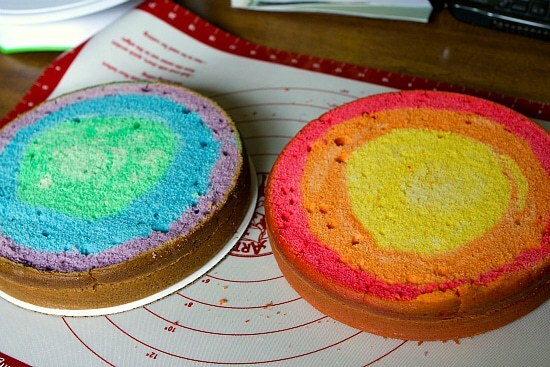 Here’s what the tops of the cakes looked like after they were leveled… so colorful! At this point, I went ahead and filled the cake and then decorated it. I received a couple of questions on how to make the train tracks on top of the cake, so I’ve included that short description below as well. 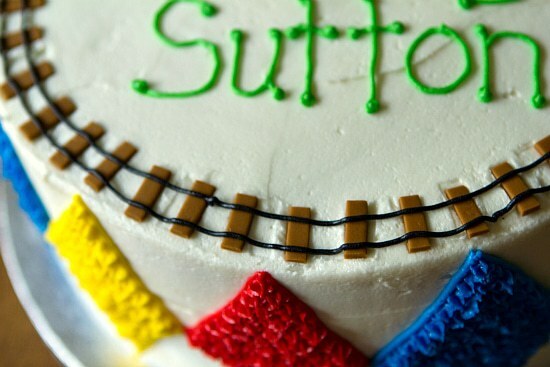 My friend told me that the tracks needed to be ¾-inch wide in order to accommodate the plastic trains that they wanted to decorate the cake with. I used brown fondant rolled out to about 1/16-inch thickness, and then cut a long strip ¾-inch wide. From there, I cut across the strip in ¼-inch increments until I had as many “tracks” as I needed. Once I was ready, I spaced them evenly around the cake. To make the rails, I used a #2 decorating tip with black icing. And here was the finished cake, before it went out for delivery and got adorned with the adorable train set that you saw in the first picture. Hi Michelle! Long time reader, shy poster :). I made your rainbow cake this weekend and it turned out so cute! Fun to make too. I used gel food coloring – the colors turned out really vibrant. Thanks for the inspiration! Hope you’re feeling well. 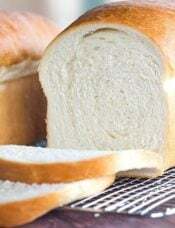 I love reading about little brown eyed baker baby! 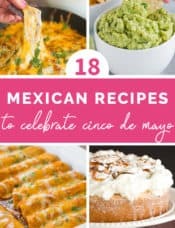 Is there any specific brand of cake mix that you recommend using? Hi Courtney, No brand in particular. Whatever you’d like! Hi need your advise.. 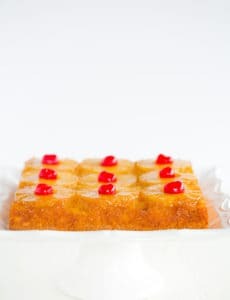 I have a rectangle cake pan 15x10x2 – need to bake a cake for my sons birthday – how much boxes of cake mix do you think i woudl need. OR if i followed your pefect cake recipe how much would i need to increase it by to get a perfect cake! thanks Sharon. Hi Sharon, I am not sure how much of the perfect party cake batter you would need, as I have never measured that batter out. For the amount of cake mix you would need, I would check that link above to the wilton chart. I think that a box usually yields 4-5 cups of batter. I love the look of Rainbow cake. 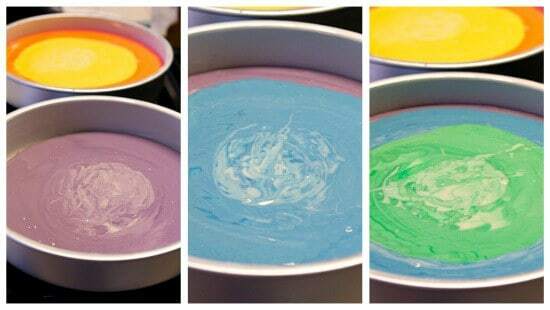 Great step by step on making this rainbow cake. I have a different question, about the frosting. 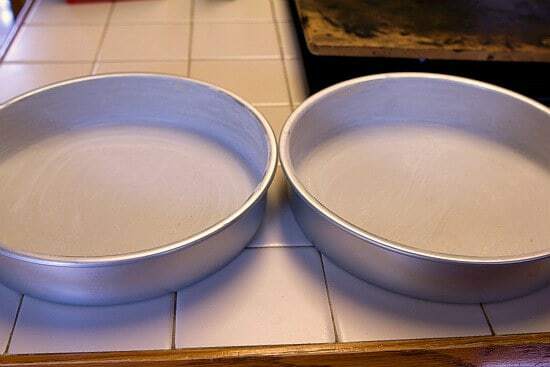 every time I make a cake and try to frost it, I mess it up and the plate the cake stands on get dirty and its never clean as in this picture. so how do you do it? first you put the cake on a plate i guess (here with tin foil), then use a spatula to cover it up? cause if I do it that way the plate gets dirty and when I clean it I damage the frosting, and if I do it on a different plate and move the cake, I have to touch it and then the frosting gets messy again. so I am lost…thanks ! Thanks a lot. Ill give it a try. Trying this out as we speak! I’m doing it with a hoe recipe though, so it may not come out as vibrant or fluffy, but hopefully the results will be similarly beautiful and delicious. : ) News on it later! Just wondering what was used to make the decorations around the outside of the cake? Hi Emma, I used a star tip for the inside of the diamonds. I don’t remember the exact size now, but it was probably a Wilton #16 or #18.
is’t okay to use a cheesecake pan’s? or will the batter get through ? Unless that’s the only pan you have in your kitchen, I wouldn’t use a springform pan; go with a regular cake pan. Hi Marissa, I think most box mixes yield about 4.5 cups of batter. 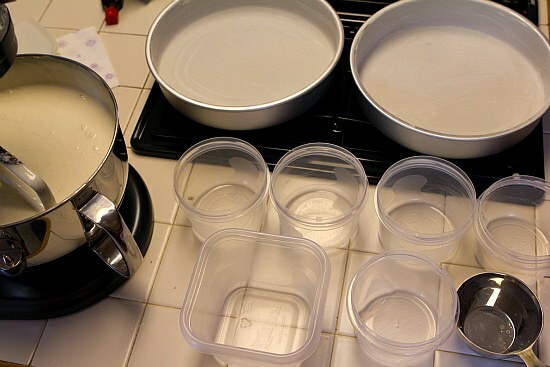 It all depends on the size cake you need – I would use the 4.5 cups as a starting point and consult the cake batter chart linked to in the post and figure out what you need based on the size cake you are baking. is this cake sturdy enough for fondant icing? my son’s birthday is coming up and i would like to try this. thanks so much. 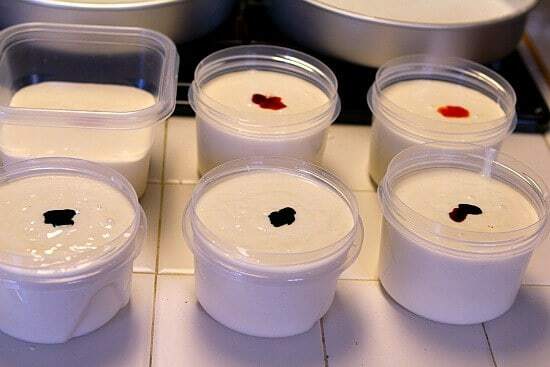 Hi Maria, It all depends on the recipe that you use, as this is merely a tutorial on making the inside colored. hi, what did you put in the middle of the cake? butter icing? or could you put nothing? love this recipe and the cake looks lush! Hi Aimee, Yes, I just put a vanilla buttercream frosting. 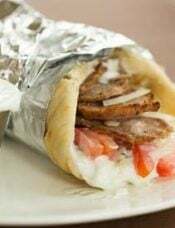 You could add your favorite filling, as well. I would put at least a very thing layer so the cakes don’t slide off of each other if you stack them and aren’t planning a full filling. 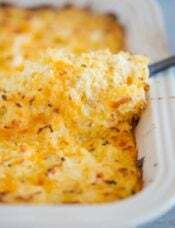 Is it possible to use a square pan instead of a round one? Hi Monique, Yes, you can, but square pans typically hold more batter than round ones. I would consult the cake batter chart (linked to above in the post) to make sure you have enough batter. hi its such a cute cake i have been planing to bake for very long time .. thnks for sharing this great tutorial.. but i wanna sk about the frosting i checked the the frosting u add .. and i dpnt have shorting i mean its not available where i live .. so how can i have white butter cream frosting or do you recommend any other kind of frosting .. we have here cream chantee i am not sure about the splling but its teasty and white but it milts so quiqly and i need to take the cake for a party where is no fridge .. what do u recommend ?? I would recommend this frosting: https://www.browneyedbaker.com/2010/10/28/vanilla-cupcakes-vanilla-buttercream-frosting/. If you can find clear vanilla extract that, use that, otherwise it won’t be perfectly white. But, it will be delicious! I love this cake! I just made it 20 minutes ago. I am so excited to decorate it. I am going to make it look like a girl scout cookie box! 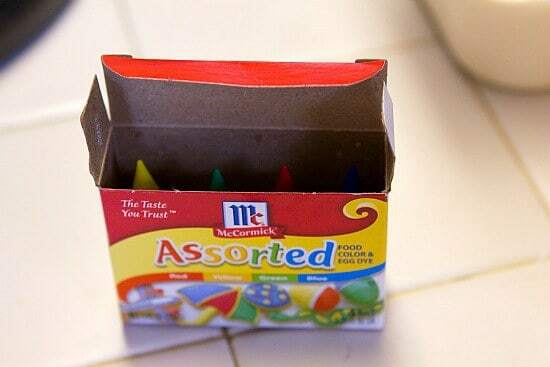 So you only need 1 box of cake mix? Hi Ashlynn, That would depend on how large of a cake you are making. 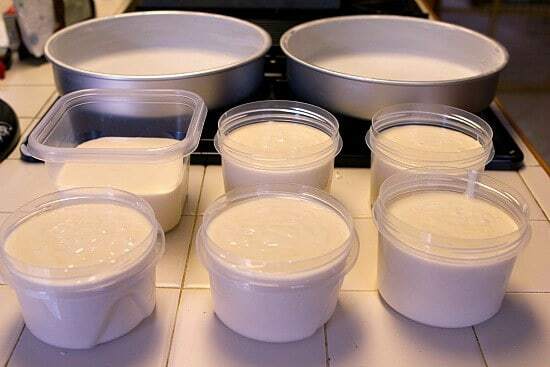 I think that most cake mixes yield 4.5 cups of batter or so (but I would measure to double check) – I would use that as a starting point and then consult the cake batter chart (link above) to make sure you have enough for the size cake you want.